How do you see the SPX closing for the week of (12/3-12/7)? 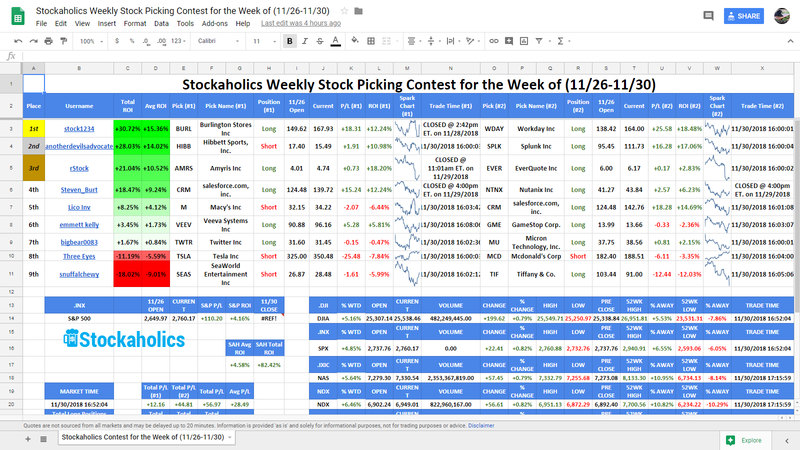 Congrats to @stock1234 the Stockaholics Weekly Contest Winner for the Week of (11/26-11/30)! On to the next! 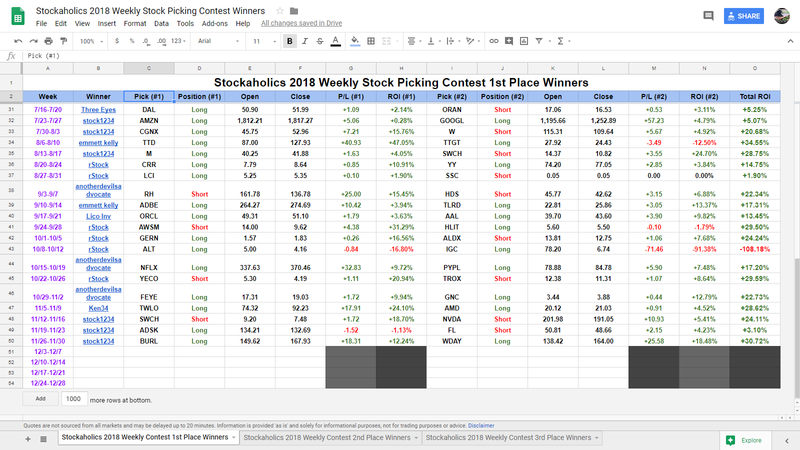 The Stockaholics Weekly Stock Picking Contest for the Week of (12/3-12/7) starts at the opening bell on Monday, December 3rd, 2018. 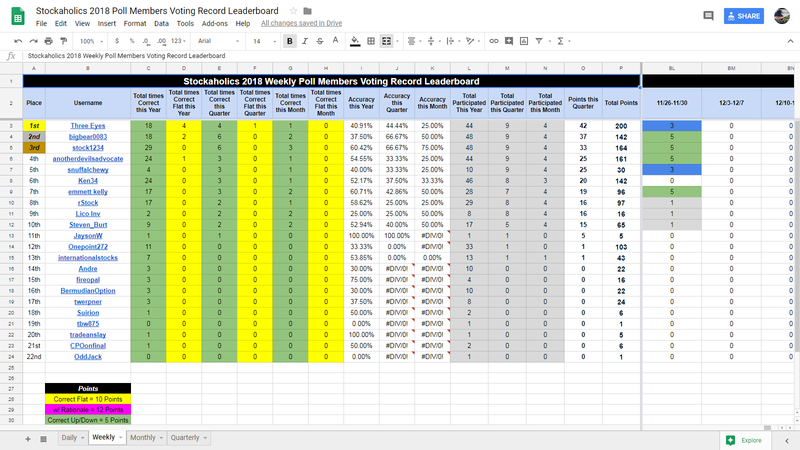 Stockaholics wins 1/2 weekly poll tally for this week. Credit goes to the UP votes! Congratulations to this week's contest winner and 9th time winner of the weekly stock contest in 2018 (3rd time winner in Q4!) -- @stock1234! Some worthy mentions also go out to our 2nd place winner -- @anotherdevilsadvocate and 3rd place winner -- @rStock! @stock1234 is our current leader this quarter with 73 points! @Three Eyes is still our current leader this quarter with 42 points! Whelp, that is a wrap from me this week ... and I hope you all have an awesome weekend ahead! Have fun and be safe! Cheers y'alls! 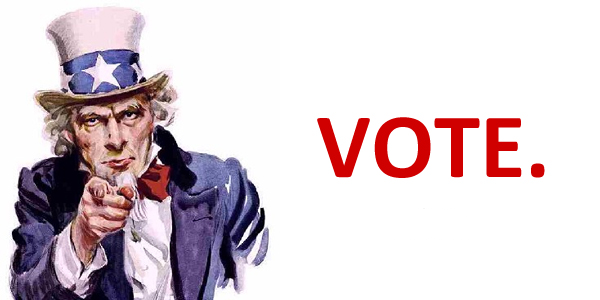 ...and please do not forget to click in your vote on the poll & post your vote before the opening bell on Monday!!! 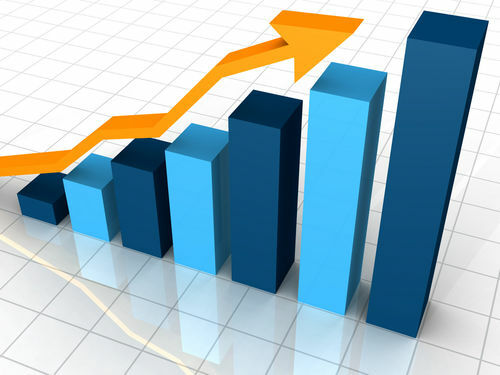 OK, so I'm going to try to get into a bit of a routine here with this new format of stock picking here at Stockaholics. 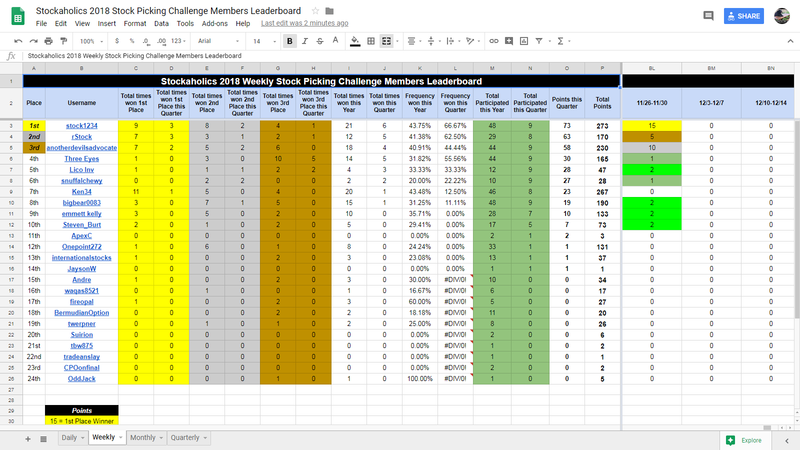 This time what I'm going to have everyone do is to just submit the Google Form down below with your weekly picks, and don't bother posting your picks on the thread, although you can still post it on the thread if you want to include rationale to get the extra points in the leaderboard. 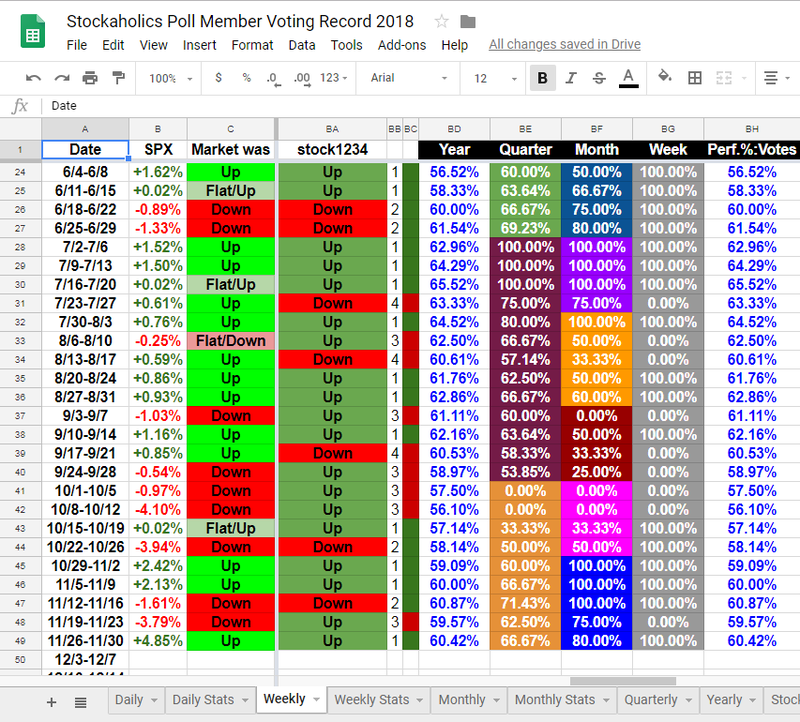 However, since there isn't a way to auto input weekly market direction votes into my member's voting record spreadsheet, all I'll just ask you guys to do is post your market direction vote on this thread. So, I'm noticing a few of you failing to submit your picks via the Google Form link in my Post #4 of this thread... Hopefully you guys will see this post and will get a chance to submit your picks via that form. FWIW, this is going to be our new format for making stock picks on these competitions from here on out. I know this is still very new here on Stockaholics, so maybe this just needs some time for everyone to adjust. The reason we are doing this new format here is to take some of the workload of running this contest off my shoulders. The Google Form now makes this process automated for me and automatically inputs everyone's picks into my google sheet. If I need to add picks manually for people because some didn't submit via the form then it defeats the purpose of making this automated. If you know what I mean. Thanks! internationalstocks, Three Eyes and Onepoint272 like this. I gotta learn how to do that .. Just saw that I have to be logged into my Google account to do that. How safe is that.? Should be fine. You can adjust your privacy settings as needed. as @snuffalchewy said, it should be fine. the reason i have everyone needing to be logged in to their google account to make picks is so that if someone ever needed to go back and change their picks for whatever reason, they can do so by hitting up that google form link again. this way they don't need to submit another form, thus inputting a duplicate entry into my google sheet, which would admittedly be more work for me since i would have to go in and manually delete the duplicate entry, as the goal of this new google form format is to minimize as much time as possible to run this. meanwhile, i've just gone ahead and manually input your picks in for this week, so don't worry about submitting the form. hopefully you'll be able to log in to your google account and make picks via the form from next week.